Earlier I reviewed a book about Bureus’ booklet Adalruna Rediviva and wrote an article about the man himself. If you haven’t read that article, I suggest you do before you start with this one. This time I want to say a bit more about Bureus’ wonderful runic hieroglyph. Bureus’ furthark consists of 15 runes. More about that in my other article. The rune-cross consists of all 15 runes, thus representing All or Totality. Bureus saw his runic system as the mediator between the divine and human worlds. The creative word of God is the mediator between Him and His creation. Consequentally Bureus saw the runes as the divine or original language. Bureus’ runes are of course letters, but also numbers, like with the Hebrew alphabet, but not entirely. Bureus has only 15 runes, so no rune for every number. He left out the even numbers which highly cuts the ‘Notaricon’ possibilities short. But Bureus doesn’t work as much with the numerological values as in the Kabbalistic system of Notaricon it seems, but this system does allow you to find numbers in texts and especially the rune-cross. All of the letters of Bureus’ futhark can be found in the rune-cross, so also all the numbers can be found in it, as you can see below. The total of the cross comes to 2775, I don’t think this number has any special significance. A few things are that the right (for the viewer left) arm of the cross counts up to 366 or a year in the complete cycle of the sun, the left arm 794 which according to Bureus is the number of years between the conjunctions of Jupiter and Saturn. Leaving out the K-rune, the vertical beam counts 1605, the year in which Bureus invented his runes. As you can see, you can make anything out of a figure like this. 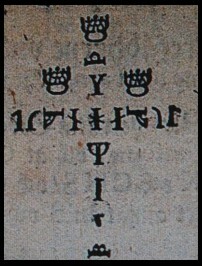 Bureus used a lot of number symbology in his writings, so it is not unlikely that he did they same with his cross, but this is about as far as I know of meanings. Gibberish, maybe… The right arm (for the viwer left) says “TRON” which supposedly means “faith” “which represents one of the qualitities that the adept must have”. The right arm represents the Word of God. The other arm says “AFUL” (“åful”). “The first rune denotes ‘honour’ and Bureus interprets the meaning as “honourable” (Karlsson), or “permanent fullness” (Flowers) and in another explanation “glorious” (Flowers). “Faith and honour are the two arms on the adept’s path toward spiritual elevation.” (Karlsson) The first word the other way around makes NORT, not just the North, but “N(ådens)ORD / N(ödens)ORD” or “word of Grace / word of Need” (Flowers p. 21). Flowers continues to find words in the cross, but I suggest you get his booklet when you want to know it all. Both writers have more interesting information about the rune-cross. Karlsson sees Odin hanging on a cross, “Bureus equates Odin on the Yggdrasil with Jesus on the Cross”. The person on the cross can also be Byrger (Flowers), the mythical priest who invented the runic script. Also he is equated with Christ. – right arm – Odhes – O – dies Mercurii or Wednesday. Within the horizontal beam (the ‘Nine Rune-Width’ in Karlsson’s article) contains the runes “R U N A”. If you take them out, you can imagine that you can make a gate with their forms, R and U on top, N and A below them. “An image of grace and honor opening a gate to eternal peace and rest.” (Flowers p. 19) These runes are not in the body of Byrger / Odin / Christ and are a part of the cross under Byrger’s body. Bureus says that “runa” means ‘experience’. The other group of four runes that form the cross are the runes are B, I, H and K, or in Bureus’ view “PIGKind”, meaning ‘son of the virgin’. When you follow the lines of the runes N, M, A and downwords from K you get some kind of inverted Monas Hieroglyphica. The symbol “signifies the seven-fold holy spirit united with the Word of God.” This is because it concerns the runes KAHNIS, or “gæghn mis”, or “run with me”. “This is the voice of the one who calls from above, and those who answer from below call out” SINHAK, or “sim äghn k(ynd)”, or “we are the property of the Son, as if one”. (Flowers p. 20/1). The remaining runes not part of the hieroglyph again have their significance: evil. The vertical beam has seven runes, which Karlsson says are the seven steps upward and downward in the process of initiation. In Bureus’ hieroglyph you have to ascend from “Byrghal” (representing two gates, for ‘coming in’ on the way down and ‘coming out’ on the way back up) to “Thors”, the latter representing the God Thor. “The connector in this process is Odin who is represented by Haghal”. This is a strange remark, because Odin has his own rune, the “Odhes”. Karlsson gives some (possible) meanings to the seven runes of the ‘Seven-Rune Height’ (as Bureus called it), but I will continue where Karlsson connects the seven runes with the seven stages of alchemy. Bureus supposedly wrote a book called Cabalistica in which he gives his theory of the seven steps of initiation. One way of picturing this is by naming the stages of the proces of the creation of the elixer of life. The first step is called ‘calcinatio’ and of course the bottom rune “Byrgal” is the rune connected to this stage, then we go to ‘sublimatio’ (“Sun”), ‘solutio’ (“Idher”), ‘putrefactio’ (“Man”), ‘destillatio’ (“Haghal”), ‘coagulatio’ (“Kyn”) and ‘tinctura’ (“Thors”). On the same page (according to Karsson) the following alchemical process is named: ‘sublimatio’, ‘descensio’, ‘distillatio’, ‘calcinatio’, ‘solutio’, ‘coagulatio’, ‘cæratio’ and ‘fixio’, but the order of the numbers of the stages is 1, 2, 3, 4, 5, 6, 8, 7, the reason for this is unclear. Also eight instead of seven stages, so not enough runes. Maybe the three crowns above the rune-cross have some significance in this picture. Karlsson continues with a Hermetic path of illumination (‘tenebre’, ‘splendor’, ‘lumen’, ‘lux’, ‘luminare’, ‘modus entis’, ‘principius absolutae primum’). Also the lower three runes supposedly belong to evil (‘mala’) and the upper four to good (‘bona’). The last theory of Bureus that Karlsson names is that of the constitution of man, “Byrgal” is ‘below’ this constitution, but then follow ‘corpus’, ‘natura’, ‘opinio’, ‘ratio’, ‘mens’ and ‘unum’. After this Karlsson comes with his own theories connecting the seven runes with the seven chakras of Eastern philosophy. Flowers on his turn, connects the seven runes with five doors (Thors and Byrghal are the beginning and the end) with gifts on the ascend of descent of the “caller”. K represents the highest realm of the Father, H the Father’s Will, M manna, I the result of sin (guilt) and the last S temptation. To close off I want to say something about the three crowns. They are they national symbol of Sweden and Bureus thought that the symbol was extremely old, because they can be found on the Mora runestones. Later was proven that these crowns were added later to the runes. Of course there is a lot of ‘three-symbology’ both in Bureus system and the ancient Northern religion, so you can give numerous explanations to three crowns. The writings of Bureus have been scarsely investigated. The Swedish scholar Susanna Åkerman is more interested in Bureus’ Rosicrucian connections, but she sure did pioneer work in finding the scriptures in dustry libraries. The Rosicrucian writings of Bureus are relatively easy to get, I studied two versions of both of them in the Amsterdam Bibliotheca Philosophica Hermetica. As for the more ‘Northern’ ideas of Bureus I can only work with the investigations of Flowers and Karlsson whose short writings I completely ripped for writing this and my other article. I hope they don’t think that I gave away all their findings, but I can asure you there is more information there, so just have a look at my bibliography and try to lay your hands on the sources if you are interested by what you read above. As you can see the Runic Cross of Bureus is one of these hard-to-understand esoteric symbols with a multilayered explanation. It seems that Bureus wrote quite a bit about that himself, but I have to leave it to people with access to these works to provide information. Maybe with the starting ideas of Bureus you will see things within the wonderfull symbol yourself as well. Thanks! Nice job! Keep upp the good work! This cross is an upside down cross like that which Peter was crucified on. It bears a different meaning than the symbolic upright cross of Jesus. Apparently this Bureus discovered the ‘keys’ as it were. He has positioned his dialectic right where it ought to be, his a-z. The symbol ‘sun’ is the center of the upright cross. The hieroglyph is an expression of pregnant potential, outcome, or rebirth, stemming from double constraint toward temptations (Lion and Wolf), as the three dimensional symbol center is axis and two horizontal members respective of full geometric expression. The outcome interdependent upon the testified interpersonal relation of God Alone is My Lord. The symbol for Man rather means Hu-man, or Godly Man. He with his arms raised, palms out, praising the uncontainable awe that is God. He standing on Solomon’s Porch looking out upon the Kingdom of Light within and without, as he sees no separation twain the two.